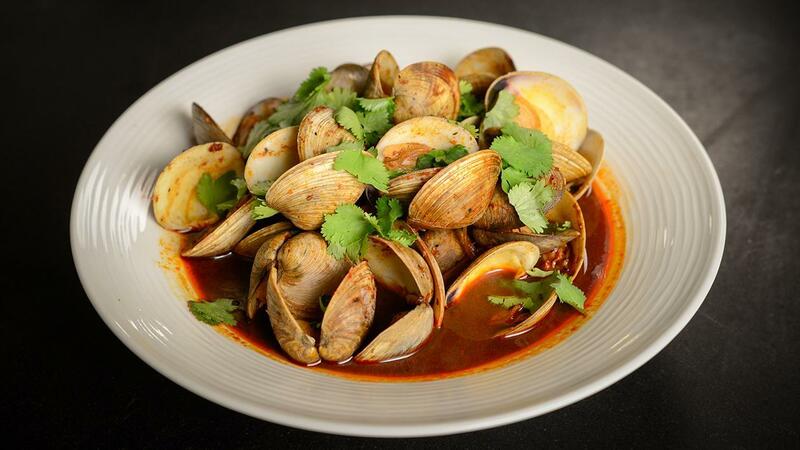 Utilizing the Birria base and liquids to create a unique savory clam dish. Toast the chiles on a hot griddle or skillet over medium heat until browned, not burned. Remove the seeds and veins, then place the chilies in a bowl and cover them with hot water for 15 to 20 minutes until rehydrated. Reserve 1 cup of chili rehydration water. Add in 1 cup of chile rehydration water along with 1 cup water and Knorr® chicken base and blend until smooth. Over a medium heat in a wide pan, heat olive oil and sauté the shallots until tender. Add in the prepared Birria sauce and prepared Knorr® Demi Glace. Add in clams and simmer until opened.